Is it time for a Back To School Haircut? Right now JC Penney is offering free kids haircuts for any child in grades K-6th. 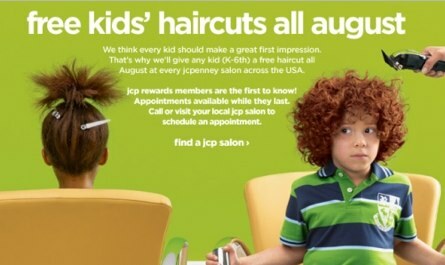 Just call 855-JCP-KIDS or your local JCP salon and set up an appointment! Offer is good until the end of August. FREE Disney Parks Vacation Planner DVD!